On a late winter afternoon, London’s frenzied activity seems to have drawn to a halt. Only a few barges move slowly under Charing Cross Bridge, with the hazy silhouette of the Houses of Parliament barely visible in the background. This painting is one of a series of views of the Thames produced by Monet between 1899 and 1901 from the Savoy Hotel, overlooking the gardens of the Victoria Embankment. Though varying in subject-matter, these paintings share a common aim: to capture the light filtering through the winter fog. Of the thirty-seven views comprising the series, only twelve were finished on site, most being completed in Monet’s studio at Giverny, where he showed less interest in topographical accuracy than in the treatment of light as a whole. Monet's series of paintings of views of the River Thames was concentrated in the years between 1899 and 1904. On three occasions Monet returned to the Savoy Hotel, and from his high vantage-point there, executed views of both Waterloo and Charing Cross Bridges. His friend, the art critic Gustave Geffroy, recalled visiting Monet with Clemenceau in 1900: "Several times we saw him set up on the balcony of his room, overlooking the Thames-Charing Cross Bridge on his right, Waterloo Bridge on his left [...] In front of us the Thames rolled its waves, almost invisible in the fog. A boat passed like a ghost. The bridges were barely discernible in that space, and on them an all-but-imperceptible movement gave life to the mist's opacity; trains passing each other on Charing Cross Bridge, buses streaming across Waterloo Bridge, wafts of smoke that soon disappeared into the thick and livid vastness. It was an awe-inspiring, solemn, and gloomy spectacle [...] One could almost believe that everything was about to vanish, disappear into that colourless obscurity." In the present painting, the fog-covered Thames is seen on a late winter's afternoon, barges slowly move upstream, with the hazy silhouette of the Houses of Parliament barely visible in the fading light of the setting sun. Monet confessed to the art dealer and diarist René Gimpel (entry of 28 November 1918) that he only loved London in the winter-with the fog. "Yes, because I love London much more than the English countryside; yes, I adore London. It is a mass, and ensemble, and it is so simple. And then what I love most of all about London is the fog." During the three winters that Monet worked in London (1899 to 1901), he is said to have completed only twelve views of the Thames on the spot. Once back in Giverny, he worked on at least eight more canvases. And it was not until 1904 that he eventually exhibited his London views-37 of them-at the gallery of Durand-Ruel in Paris. Virtually all Monet's paintings in the series were worked upon in the studio, and he became less interested in topographical accuracy and more prone to emphasise atmospheric conditions. For example, he eliminated Cleopatra's Needle from the view of Charing Cross Bridge. At the 1904 exhibition the critic Georges Lecomte claimed that Monet had never "attained such a vaporous subtlety, such power of abstraction and synthesis." Gustave Kahn, erstwhile symbolist poet of the 1880s, friend of Seurat and Fénéon, found other analogies in looking at the eight views of Charing Cross Bridge. "The water is like a mirror on which the vaporous shadows chase and succeed one another-fragile, slow harmonies, like those of Schumann, if you will, or of Faure." 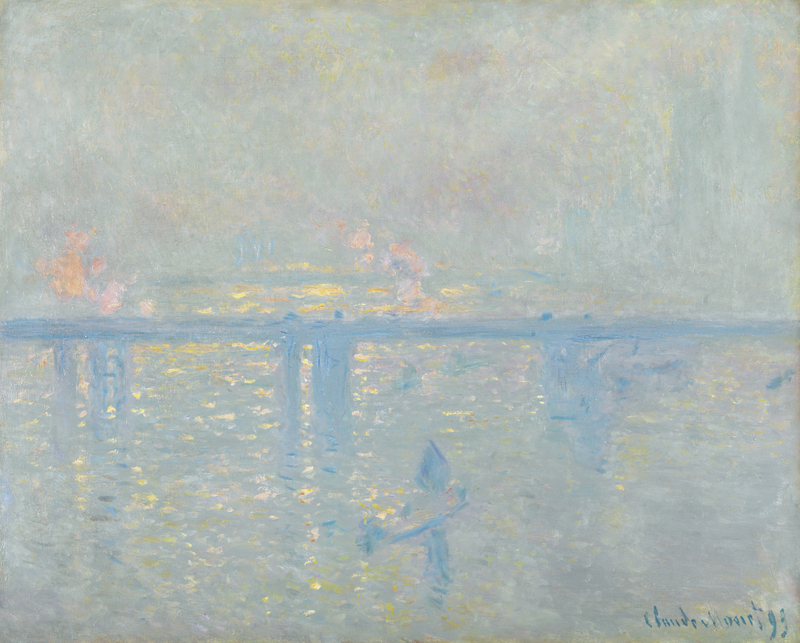 Charing Cross Bridge was already acquired from Monet by Durand-Ruel in November 1901, and sold to the German dealer Paul Cassirer in 1903. It was therefore not included in Durand-Ruel's 1904 exhibition.